DOWN TIME: Kevan Carpenter '94 with the Appledore wind turbine. 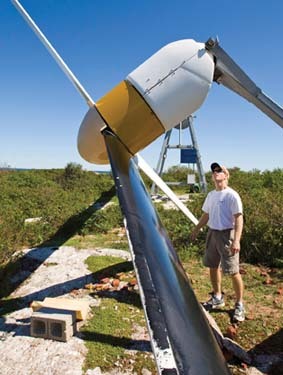 When UNH researchers erected an 80-foot wind turbine on Appledore Island four years ago, every effort was made to protect a large population of breeding gulls and scores of migratory songbirds that flock to the 95-acre island in the Isles of Shoals twice a year. Project manager Kevan Carpenter '94 of the regional air-quality monitoring program AIRMAP opted for a unique design that lowers the turbine to a horizontal position with the flick of a switch come bird woes or bad weather. Turns out the turbine, which has been brought down only for routine maintenance, has had no impact on the birds and has withstood 100-mph winds. What's more, it's the centerpiece of a growing treasure trove of sustainability practices on the island, which is also home to the Shoals Marine Lab, where students, faculty and staff live, study and perform research every summer under the auspices of UNH and Cornell. On a typical day, there might be 80 people on the island. "The wind turbine was the catalyst for an array of solar panels that have an output capacity of 7.5 kilowatts—about what an average household would use for all electrical needs," says Carpenter. The panels have been a boon for the lab, which used to lose power when biodiesel generators were shut off in the fall. And with the wind turbine whirling away, AIRMAP researchers can now collect atmospheric data 24/7, year round. The power flows from a 7,000-pound rack of high-tech batteries housed in a World War II concrete observation tower. Other advances include composting toilets, more energy-efficient appliances and more sustainable building construction. Every summer, UNH engineering interns look for other ways to increase sustainability. "I think there are a lot of opportunities for UNH students to get a hands-on look at real-world sustainability solutions on Appledore," says Carpenter. "And as a result, we can decrease the island's carbon footprint."